If you are looking for a heat pump that will last you a long time but won’t cost a fortune and won’t break easily, consider the American Standard Silver Series. 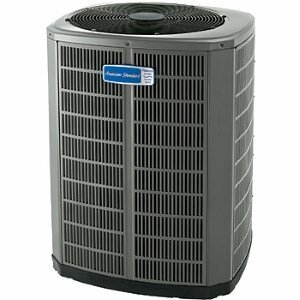 The American Standard heat pumps operate quietly and give you longevity and performance, and when paired with other HVAC components, boost that effectiveness even higher for great heating and cooling. Like many of the other American Standard heat pumps, high efficiency doesn’t have to come at a high cost. The Silver Series versions are energy misers that not only meet but exceed federal standards and therefore are also kinder to the planet. You still get great heating and cooling in all parts of your house, too. The AccuLink control board inside the heat pump helps you stay comfortable year-round by making tiny adjustments to the components’ output to maximize its performance. It controls the compressor as needed to ensure that the temperature inside your home stays steady. These models feature a single-stage compressor and a single speed motor, so you don’t have the step-up, step-down capabilities of the Platinum and Gold models. A ten year compressor warranty and a ten year outdoor coil warranty are hallmarks of the quality that goes into the manufacturing of the Silver Series heat pumps. The construction design gives you quiet operation no matter the season, between 70 and 76 decibels no matter which model you pick. An ozone-safe coolant means you get effective cooling at a much lower cost to the environment. The Spine Fin coils are made from a strong aluminum for maximum heat transfer and minimal wear. The Duration single stage compressor is made to last. The case, base pan, and steel louvers are made in such a way as to last a long time and protect the internal parts from dirt build-up and damage. An insulator helps provide sound shielding for quiet operation under any load condition on some models. This model is the top of the Silver Series line, and features nearly twice the energy efficiency as heat pumps from years’ past, so your upgrade to the Silver 16 will instantly start saving you money on your energy bills. It’s meant to give you gold-standard efficiency at a great price while still being a reliable heating and cooling partner. You end up with quiet operation thanks to the quality construction but this model of Silver Series heat pumps does not have the insulation available on the other models. Match it with other American Standard models of HVAC units for a more efficient system overall. You can get as much as 9.6 HSPF heating efficiency in the winter with a furnace supporting your heat pump. This model gives you a consistently comfortable home and steadily quiet operation with a single stage fan and single stage compressor, but without sacrificing energy efficiency along the way. You still get a 16 SEER efficient cooling factor in the summertime, so you don’t feel like you are baking even on the hottest days. Unlike the Silver 16, you do get an insulator to keep the noise levels under control on some versions of the Silver 15. Though not as quiet or as efficient as the other two models in this line, you still get a quality product with the Silver 14 heat pump. Coming in at just one decibel higher on the upper range of noise (71-76 versus 71-75 on the Silver 15) and at 14 SEER cooling, you can see that you don’t sacrifice much with this model. Heating HSPF is rated at 8.5 when paired with a furnace to deliver the most energy efficient way to heat your home with this model, a plus in the coldest regions.